An essential tool for anyone who sews is the dressmaker chalk and fabric marker. Marking one's fabric pieces is important, because it is a visual guideline you can use to line up pieces or make sure things are even. At one point or another, you will need to transfer marks to your fabric and these are specialty tools that allow you to do so. There are many different options out there so you can find one that you feel works best for you or, if you're like me, you'll use a variety of them. The most common marking tools are beeswax and dressmaker chalk. You can also get the chalk in pencil form, if you want something a little easier to handle. There's also a variety of markers. Some of them disappear after a number of hours and some only disappear after wiping it with a damp cloth. 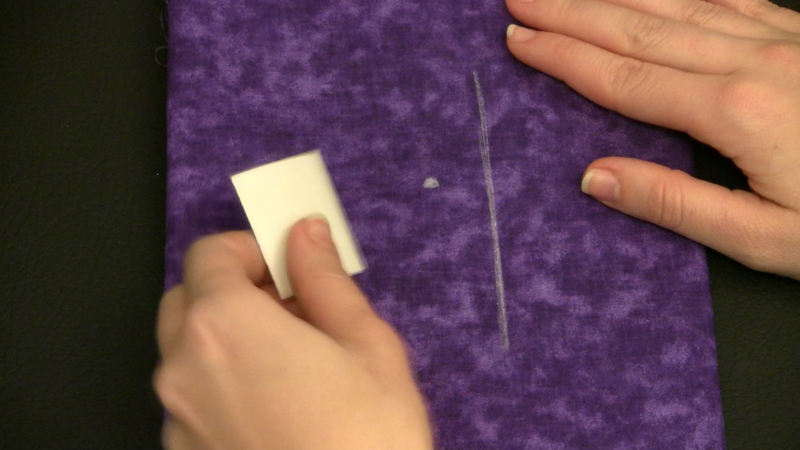 You also have to determine your fabric type when using a marking tool. Some are better on fabric with a nap, while some do not do well on nap at all. If your fabric is dark, then it's best to use a light colored marker. If it's light, then it's best to use a darker color marker. You'll also want to take into account the fabric care. If your fabric is dry clean only, then it probably isn't a good idea to use a marker that needs to be wiped with a damp cloth. You just want to make sure you can see any markings that you do as this becomes a great visual aid later in your work. Also, just as important, is to remove the marks once your project is complete. It's hard to show off your new beautiful dress when you forgot to erase your blue dots along the back. Once that step is done, you're good to go. Good video, important to know the difference on marking tools , thank you!! !